Other neighborhood cats may wander in. Wildlife such as a skunk or raccoon may come in, looking for food. Your own cat may bring in a dead mouse and hide it in your closet...I've had this happen once. One solution for this conundrum is to build a cat patio aka a catio with PVC tubes! This way, your cat can have the luxury of breathing in fresh, outdoor air without wandering off too far. This tutorial will guide you through the steps of planning the design of a catio, obtaining the necessary equipment, and lastly assembling your very own catio. I'll also go over all the mistakes I made along the way, so that you can be saved of some trouble. First off - Why PVC? Much easier learning curve than woodworking. 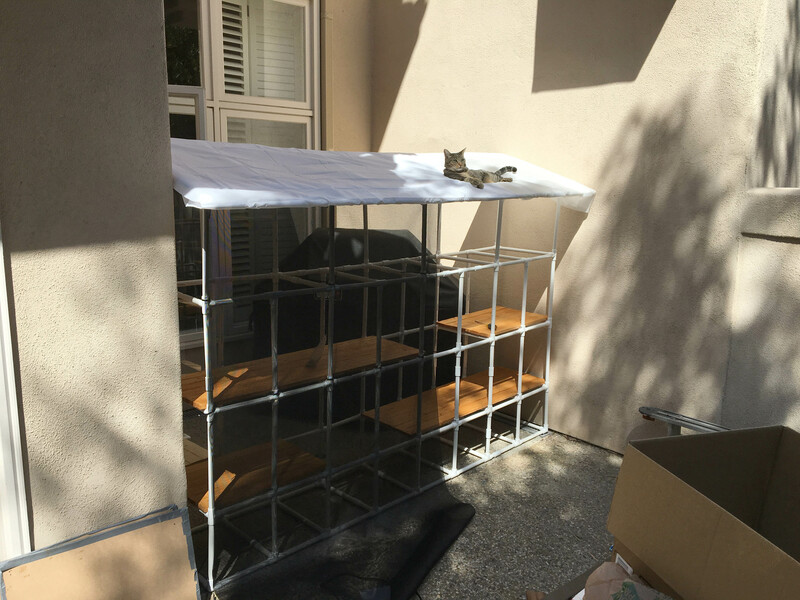 If you ever need to move homes, you can disassemble and reassemble your catio quite easily. Don't like your current catio design? Go ahead and take it apart to build an entirely new structure! No need for expensive tools - just cut with scissors and fit! Head out to where you plan your catio to be and start formulating what your design should look like. Take measurements, and be wary of the intricacies of the planned area. Be sure to take careful note if the ground is slanted, as most grounds are in order to guide rainwater to underground gutter system. After you're done scoping out the space, starting formulating a design. It can be helpful to physically point your finger and draw imaginary paths of how your cats will traverse the catio. Once you are finished measuring out the area, it's time to get supplies. You can find most parts from your local hardware store (Home Depot, Lowe's). However, there are some specialized parts (such as the 4- and 5-way PVC tubings) that are only available on Amazon. PVC tubes come in various diameters, from 1/2" sizes up to 1 1/2". I went with the 1/2", since it was most budget-friendly. Remember that you're not only paying for the cost of the tubes, but also the fittings, which get expensive in relation to an increased tube diameter. Make sure to invest in a quality PVC Tube Cutter. 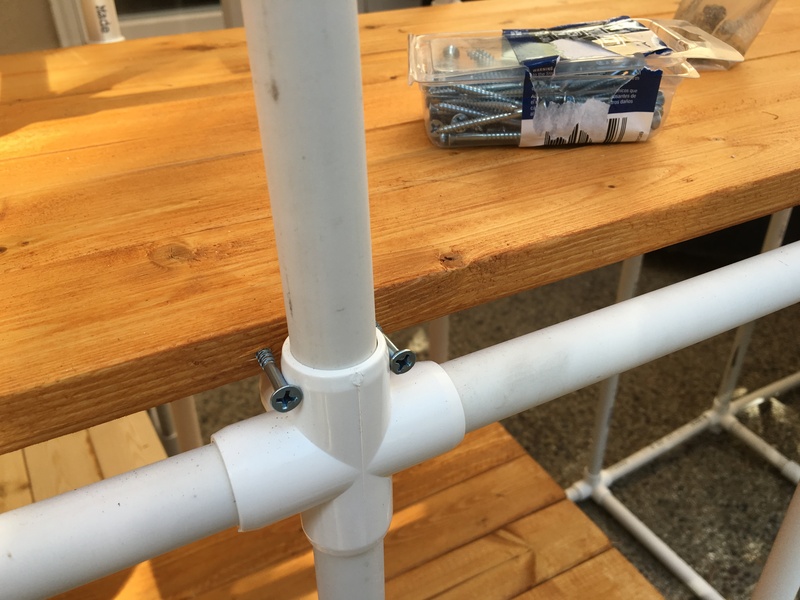 My first PVC tube project was a closet hanger, and I didn't have the proper cutting tools. I ended up using a regular old handsaw I had in my garage. Oh boy... each cut was a workout. I later found out about these specialized PVC Tube cutters which saved a ton of effort. Above are two types of cutters. I used the cheaper one (on the left), which is about a fifth of the cost. For the purposes of building a catio, the cheaper cutter works wonderfully. After sketching out your design, find out the pieces you need. You can pick up off-brand three-way corner pieces, tees and crosses from your local hardware store, but I found that the ones from Formufit fit much more snugly, and are easier to remove in case you mess up. Additionally, the amount of pipe that sticks into the adapters are consistent, allowing for an even balance across your catio. 4- and 5-way connectors were unavailable at most local hardware stores, since these are non-standardized fittings. The only place I found them was through Amazon. Again, these are from Formufit, where the fittings are smooth, and easy to disconnect if you mess up. I've tried several different types of barriers including garden lattice fences, which turned out to pretty ugly. It made the catio feel like a prison. After shopping around some, I found that pet screen door covers work the best. 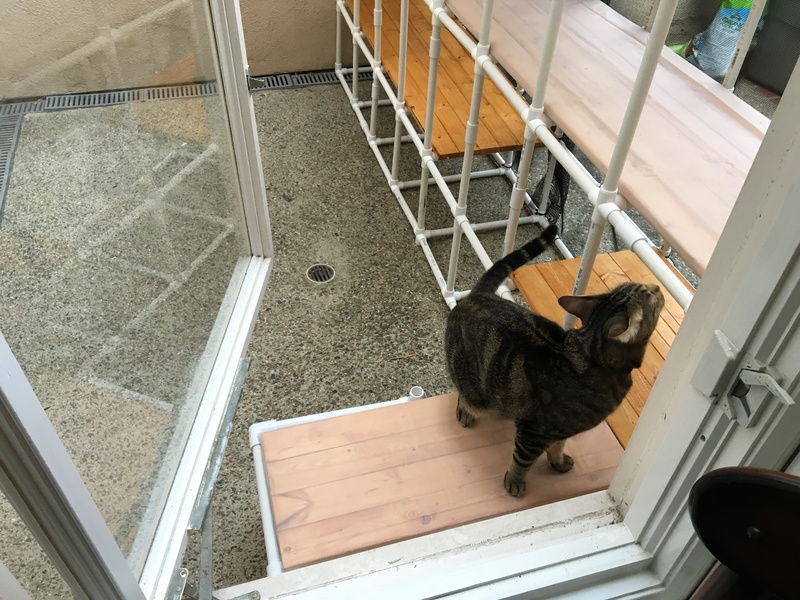 These are different from regular screen door covers, as they are more durable and resistant to cat scratches and bites. 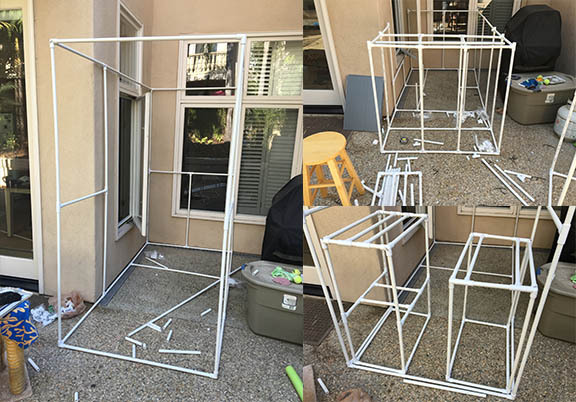 To harness the pet door screen onto the PVC tube, you'll need to poke holes into the screen and attach them to the PVC skeleton with zip ties. These are extremely cheap, and are often sold by the 100's. Make sure to get the black ones to match the color of the pet screen, but also some white ones if you plan on attaching a white roof. I planned for a roof, so I bought about two shower curtains. I live in an area that doesn't rain too often, so these should be good enough. If you live in a windy and rainy area, you might want to get a strong, durable tarp that can last through several seasons. Make sure to think about how your cat will go in and out of the catio. If you're connecting your catio through a window, it's a good idea to obtain a pet door flap such as the one below. 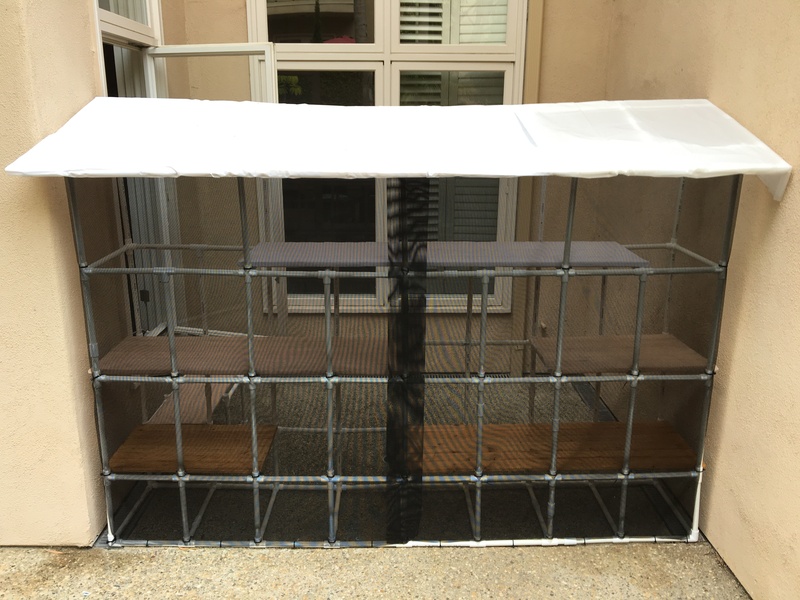 Although this catio primarily uses PVC tubes for its structure, you'll still need some wood for the walkway. If you can find nice, long panels that are 10" and 15" wide, then you're set. Otherwise, you'll need to buy some thinner wood panels and glue them together. If you visit your local hardware store, they should have some 2.5" panels you can purchase for cheap. You'll also need to sand your wood down. Turns out there are electronic sanders you can purchase (make sure you buy the sandpaper that goes with! ), or you can just do it by hand. To paste the wood boards together, you'll need some wood glue and clamps. Some wood screws are important for stabilizing the walkway panels. Make sure to apply some weather-resistant coating so that your wood doesn't rot during the rainy season. Step 3: Cutting the PVC Pipes to standardized sizes - 10", 15"
My very first attempt at the catio was a huge blunder. I jumped in without much forethought and started cutting away. I didn't think about the design in terms of stability, and started cutting and fitting as I built. My tubes were all of different sizes and ultimately, the base wasn't stable enough to handle the jumpiness of my cats. This is what happens when you don't standardize your tubes, and decide to make up the design as you go - dangerously unstable and uneven! This turned into an ugly, malformed structure that was in no way safe for my cats. 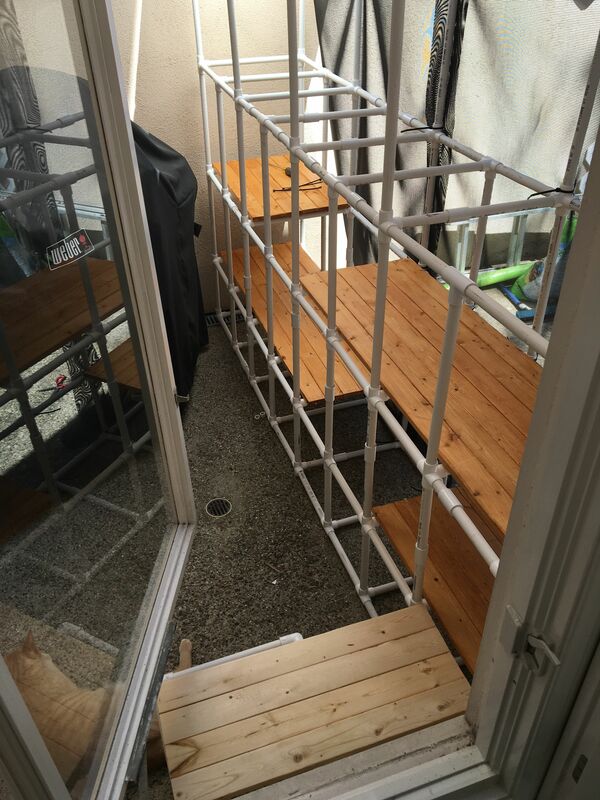 The pieces were uneven on either sides of the catio, causing tubings to unintentionally disconnect. After much frustration in trying to even the tube sizes out, I decided to start over the right way. Cutting the PVC tubes 10" and 15" worked perfectly. It turns out that if the tubing is too long, then the structure becomes unstable. If too short, then my cats aren't able to comfortably move through the tunnels. I found that 10"x15"x15" worked well as a standardization. The bottom base blocks were 10"x10"x15" to increase stability. 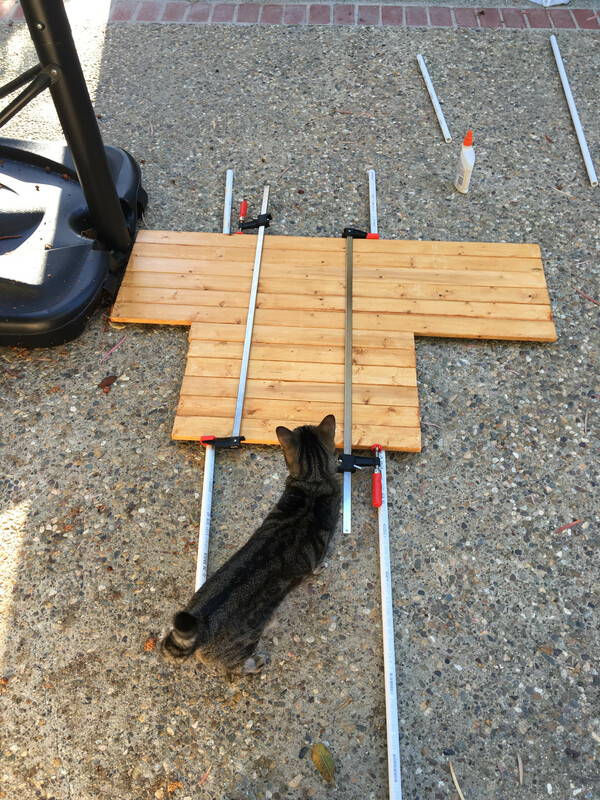 Once you standardize the fittings, it becomes much easier and less stressful to build your catio. 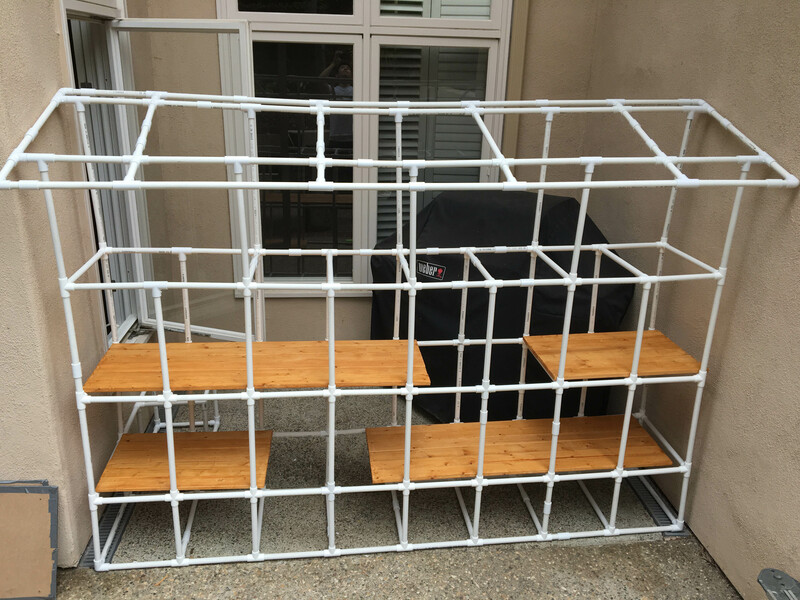 The structure is also more rigid, balanced and aesthetically pleasing, ultimately making for a better overall catio. Another reason that these are great sizes is that you can find cheap wood with widths around 2.5". If the tube width is 10", then you just need to glue four wood panels together. A width of 15" calls for six wood panels. Once you have your tubes and fittings, it should be easy to start piecing them together. I decided I wanted a roof for my catio, so I did some intense middle school math calculations to figure out the length of the hypotenuse. Since I wanted a slant to my roof, I had to use the Pythagorean theorem to calculate the length of the opposite side - thank you 7th grade math! Got the skeleton up. Looks a little uneven on top, only because the pieces weren't snug. However, I do admit that I had to do some minor cutting to even out the roof. You'll first want to sand down the wood pieces, then glue them together. Since my catio depth is 15", I needed to glue 15"/2.5" = 6 wood panels together. I applied some wood glue, and clamped the position together and left to dry for ~2 hours. I applied some glue and put the clamps in place. These are actually two separate boards, but I wanted to do the gluing process in one go to save time. 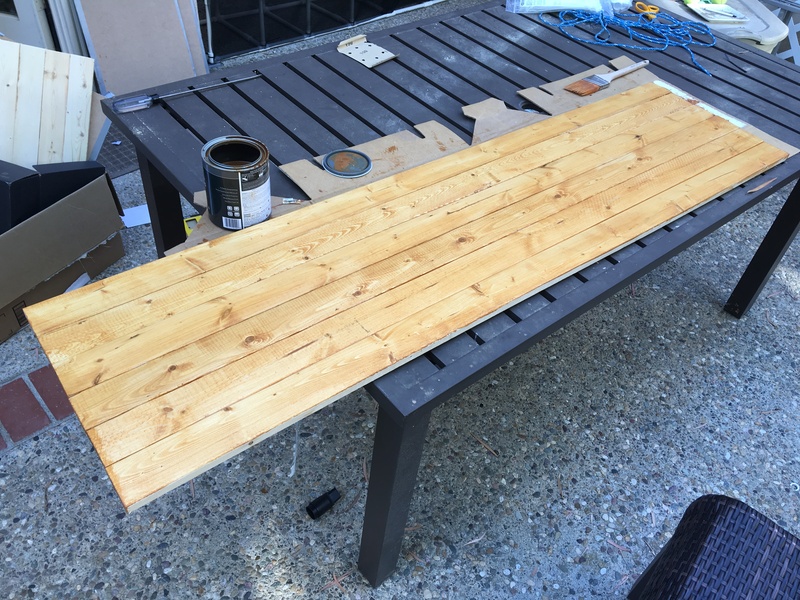 After the boards are all glued, brush on some weather-resistant stain. This will protect your wood from rainy days, and from rotting. After gluing the wood pieces together, stain them with weather-resistant stain. Once your wood is dry, you can place it in the catio. You'll also want to stabilize the wood pieces so that they don't move around too much. I did this by screwing in some wood screws with a power drill. In order to keep the wood pieces steady, I screwed in two wood screws on the sides. Surprisingly, this cheap solution works wonderfully. Lastly, you'll want to ziptie the screen to the PVC tubings, and then the shower curtains onto the roof. View from the inside. Of course, the window will be covered by a screen along with a pet door attached for easy access. I had some shower curtain material leftover after cutting a large piece for the roof. I decided to use the remaining piece to cover the wood as an extra protection layer. You can do the same if you also have leftover shower curtain or tarp. Voila! All done. Now comes the fun part of cleaning up...Hopefully your cats will enjoy it! Questions, comments, feedback? Please comment below!